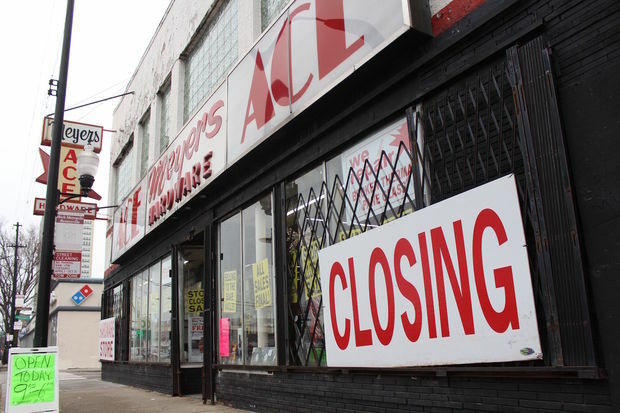 DOUGLAS — The owner of Meyers Ace Hardware said he can no longer afford to stay in business and has sold the building that once hosted some of the country’s greatest jazz musicians when it was a club. Dave Meyers said Wednesday at the store, 315 E. 35th St., that sales have been so bad over the last five years that he must close the business run by his family for 95 years. 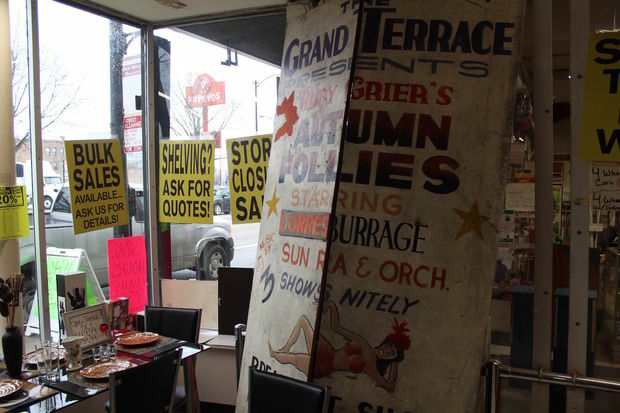 He is selling the building, which still features murals from when it was a club that hosted Louis Armstrong, Ella Fitzgerald and other greats. 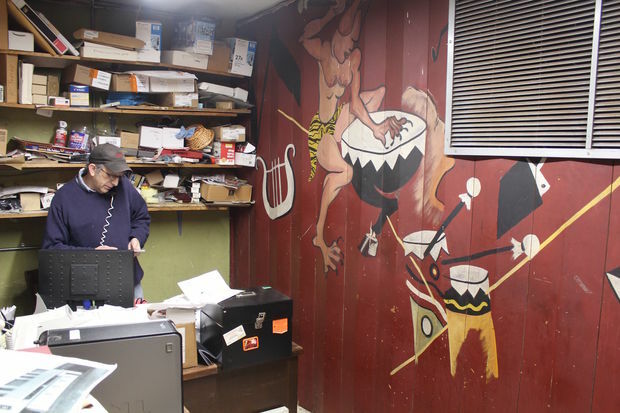 Dave Meyers said he cannot take the old murals from the Grand Terrace jazz club with him because they are part of the wall. He said he doesn’t know what will happen to the murals in his office, which include the back wall of the stage when the building was the Sunset Café and later the Grand Terrace. Both were landmark clubs that hosted Jimmy Dorsey, Benny Goodman and others. “I can’t take it off,” Meyers said of the murals, adding that they are part of the walls and thus part of the sale. Meyers declined to say who the new owner is and property records have not yet been filed that would disclose the buyer. He said the new owner told him he plans to continue using the space for retail and was interested in the jazz history of the building. Customers and neighbors said they hoped the building’s history would be preserved by the new owner. The building has been a frequent stop for tours of the neighborhood's jazz history, and Meyers said he’s still getting requests to host concerts in the hardware store to honor the building’s role in the nation’s musical history. The building was landmarked by the city in 1998, but only the exterior is clearly protected by the designation, which does not safeguard the murals or the store's sign, according to Pete Strazzabosco, a spokesman for the city's Department of Planning and Development. Meyers said he will close for good at the end of February and will move out 60 days after that. Dave Meyers said he may take with him the old placard announcing a show with Sun Ra at the Grand Terrace. “I would never have done this if my dad was still alive,” Meyers said. There is still a picture on the wall of Meyers’ grandfather and his father when he bought the building from Louis Armstrong’s manager, Joe Glaser, in 1962. That will be able to leave with Meyers along with a large placard from the building’s days as the Grand Terrace announcing a performance by Sun Ra and Rudy Grier’s Autumn Follies. Meyers said he’s not sure what to do with the placard, but said he wants it to remain attached to the history of the building in some way. He said the store has been in his family for three generations, but pressure from online retailers and the increasing cost of running a brick-and-mortar store now mean that legacy is over. “For sure there’s no next generation,” Meyers said. The store is currently selling off its remaining stock of hardware. Meyers said he’s been contacted by musicians to host concerts at the building before it is handed over to the new owner, parting celebrations for a building whose future is still unknown.